Long before Vitus Bering’s botanist Georg Steller came to study and document the flora of the Aleutian Islands in 1741 and culminating with the cohesive work done by Eric Hulten, which he began in 1932, the Unangan/Ungangas were well versed in the identification and use of the abundant plants growing in the Aleutians. The Unangax^, known since the Russian Era as Aleuts, have achieved a long record of survival and adaptation, reaching back 9,000 years and more. Their ability to provide for their families and villages in the Aleutian maritime environment, knowing the best way to achieve objectives by practicing Unangax^ ways of knowing, was beyond compare. Their knowledge of hunting and gathering techniques, human anatomy, medicine, and mortuary science, their complex spirituality, expressed in story, song, dance and ceremony and their aesthetic artistic tradition became known as marks of superior intelligence and inherent creativity. All of these advances were made in a region sometimes called a most inhospitable environment. But the draw of the treeless islands, the tundra, the steep ravines, the fogs, the rain and the winds that blow the rain and the snow horizontally with hurricane force, is virtually impossible for many Unangan/Unangas to ignore. 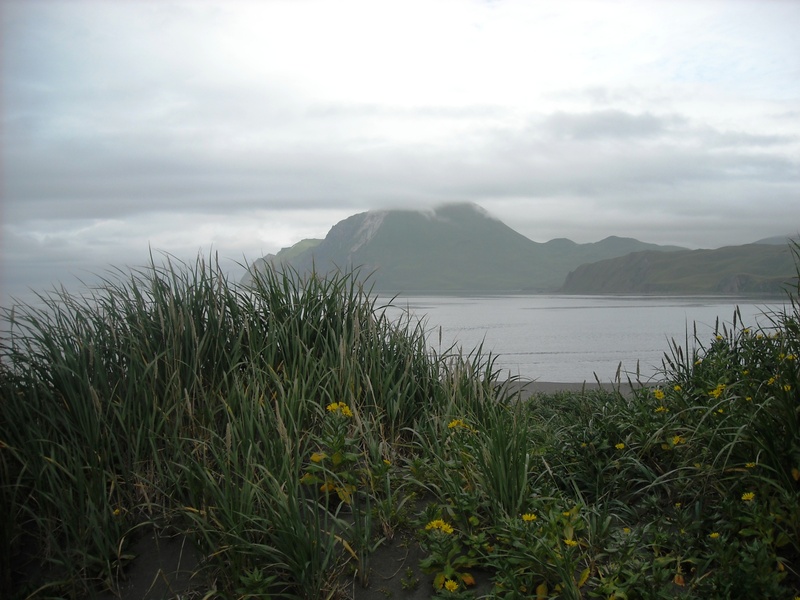 Except for a brief moment in history, when the inhabitants of the Aleutians were evacuated by the U.S. military during World War II, the Unangan/Unangas presence has continued uninterrupted. The variety of the hundreds of plants on Unalaska Island are amazing, especially between the months of June and August. Starting at the beach and reaching the very tips of the mountains, the absolute green will shock the eye. Walking from the beach to those tips will show a numerous progression of plants, some extremely sturdy, some incredibly delicate, all obviously well adapted to the environment. Habitats include the normal habitats of most islands – coastal beaches, meadows, marshes, sea-side cliffs, fresh and saltwater lagoons, streams, lakes, higher slopes and high rocky cliffs. Just taking a seat in the tundra will surprise you by the number of wildflowers, mosses, and grasses within your grasp. Overseeing all of the showy plant activity, is the beach rye grass, a sentinel of great stature and elegance, which when utilized by the people showed its traits of great utilitarian strength in the work baskets and mats that were made, and surpassed that strength with the delicate weaving of the smaller, more decorative items, common in the post-contact era such as decorative baskets, wall hangings, and wallets. Plants important to the Unangan/Unangas, too numerous to list here, included both medicinal and edible plants. Honckenya peploides, locally known as Scurvy Grass, was the plant that saved many a Russian explorer from certain death, as it provided huge concentrations of vitamin C needed to keep scurvy at bay. It was also a good healer for skin conditions. Senecio pseudo-arnica, or beach sunflower, was commonly used to help heal wounds. The trio of umbrells most closely associated on Unalaska Island, Ligusticum scoticum L. ssp. Hultenii, (Beach Lovage), Angelica ludicda L., (St. Paul Putchki), and Heracleum lanatum, (Cow Parsnip, Putchki) each have an edible and medicinal component, the most surprising of which is the ability of the St. Paul Putchki plant to heal the burn given by the Putchki. The many uses of the Achillea borealis (Yarrow) from blood coagulator to blocker of the common cold makes one wonder about the use of plants as medicines and how the uses came about. The absolute beauty of the orchids on Unalaska Island, including Cypripedium guttatum, Lady’s Slipper, Dactylorhiza aristata, Purple Orchid, and the more rare Platanthera tipuloides, or Bering Bog Orchid, are something not to be missed. The sweet smell of the blooming Sanguisorba stipulata, Sitka Burnet, and its equally sweet tea from the leaves, contrasts with the stinky fragrance of Fritillaria camschatcensis, the Chocolate Lily, and its edible roots. The berries that we gather, eat, and store each year have values that go beyond filling the belly. Outside of the medicinal uses, just the simple act of picking berries is therapeutic to the soul. Our berries include the salmonberry, high bush blueberry, crowberries, nagoon berry, and the bog and mountain cranberries. And with the advent of berry season, inevitably comes the fall colors, as our meadows and mountains take on the task of showing colors from the palest greens, to the yellows, oranges and brilliant reds. There is nothing quite as unique or unforgettable as a walk through the meadows, tundra, and mountains of Unalaska.